For this fortnight Patter has given us the word "Temptation". I found an interesting scripture that I had not really come across before which I used on my piece of digital art. The little prayer came from a devotional book by Billy Graham. I added the apple because of Adam and Eve's Temptation even though the Bible does not say it was an apple but artists usually depict the fruit that Satan used to trick mankind with, as an apple. The little word tags were in the kit and I felt related to areas where I personally am tempted. Kit used was "Fruit of the Spirit" by the designers at Life-Scrappers. Love it! The capital "T" is a great idea, and I love the verse and the prayer you chose. 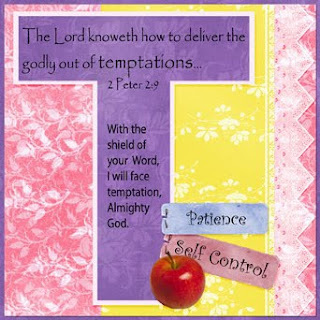 It's such a great reminder that we're never alone to face temptation! This is absolutely wonderful. I can't wait to get to mine. I love that 2Peter verse, and your wonderful art! Have a blessed weekend!